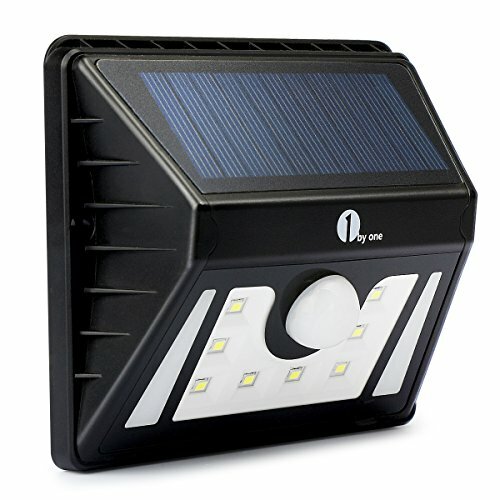 Strong Battery Capacity- With an improved design, upgraded solar panel, and increased battery storage from 800mAh to 1500mAh, 1byone LED Solar Powered Wall Light with Motion Sensor is powerful and durable when emitting light in less-than-ideal conditions. Intelligent & Bright - Numerous modes including High Light, Dim Light, and High Light Sensor modes, with an auto on/off function for dusk/dawn. 8 super-bright 1.6 watt LEDs mean this light is brighter than previous versions. PIR Motion Sensor - At night or in dark conditions, the Pyroelectric Infrared (PIR) sensor is activated by heat and motion from a distance of up to 26.2ft/8m and automatically switches on the powerful LEDs. 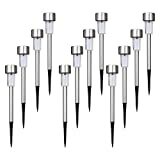 Waterproof & Durable - This lamp is tightly sealed and is waterproof, heat proof, and highly durable. Drainage holes at the bottom of the light help drain away excess water to guarantee a dry case. Convenient & Practical - Easily install this in your garden, near stairs, or in any suitable place with direct sunshine. The light fully charges over a complete day while sitting in 7-8 hours of sunlight. Best installed at a height of about 9.8-16.4ft (3-5m). It can be widely used for illumination in outdoor areas such as courtyards, balconies, walls, paths, stairs, streets, gardens, fence walls, and many more places. The LED Light will automatically charge during the day and light continuously at night. The LED Light will always emit a dim light throughout the day and night and become very bright when motion is detected. The LED Light will switch on super bright at night when it senses movement and will automatically switch back off if no more motion is detected after 15 seconds. Here at 1byone, we stand by our products 100% with a 12-month warranty. A happy purchasing experience is our #1 priority and we will happily send a product replacement if any issues arise. Please read the Instruction Manual fully before use and contact us if you have any questions.